One of the original versions of the Schindler& #39;s List is being put on sale for £1.5million. The famous Schindler& #39;s List of Jews saved from the Nazi Holocaust during the World War Two is being offered up for private sale for £1.5 million. 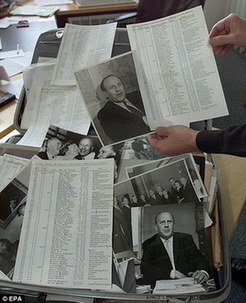 The list of 801 Jewish men, women and children, which belongs to the family of Oskar Schindler& #39;s right-hand man, Itzhak Stern, is one of only five known to exist. Being sold through the website Momentsintime.com, the old and tattered manuscript dated from the 18/04/1945, is being handled on a first come first served basis. The Stern family, whose patriarch, Itzhak was played by Ben Kingsley in the Oscar winning Spielberg epic & #39;Schindler& #39;s List& #39;, have been in negotiation with Momentsintime.com for over two years. & #39;There are five known examples of Schindler& #39;s List preserved in the world today,& #39; said a spokesperson for Momentsintime.com. & #39;This is one out of a reputed list of seven made by in total Oskar Schindler. & #39;Two are in the hands of Israeli Holocaust Museum& #39;s, one is in Koblenz in Germany and the other is in the Holocaust Museum in Washington D.C. The plain, typed names and birthdates conceal the vast historical importance and personal danger which Oskar Schindler himself went through to rescue the condemned Jews. Schindler owned a factory in Krakow, Poland, during World War Two and relied on Jewish labor to run the plant. He became distressed at the German treatment of Jews after witnessing a 1942 raid on a Jewish ghetto and used his position in the Nazi party to persuade officials that his workers were vital to the war effort and saved them from gas chambers. He is credited with saving 1,200 Jews during the war. His tale was immortalized in the seven-time Oscar winning film, & #39;Schindler& #39;s List,& #39; starring Liam Neeson. & #39;This has been a two-year negotiation for the rights to represent this list,& #39; said Momentsintime.com. & #39;We are happy to offer one of the most unique documents of World War Two that currently exists in private hands. & #39;We know from the Stern family that this is the penultimate list that Schindler wrote and is an incredible piece of memorabilia.